The field of medical technology (MedTech) changes constantly as new innovations and advancements are made in medical devices, medical IT, healthcare technology, and the Internet of Things for healthcare. MedTech product designers and engineers work collaboratively to design devices and products that will save lives and improve care while also meeting compliance regulations and federal and international standards. It’s helpful for these MedTech teams to be aware of the latest news, information, and regulations changes, and that’s why we have rounded up 50 of the best medical device, medical technology and healthcare technology news sites and blogs. The following sites, listed in no particular order, share all of the insight, breaking news, and innovations from the field and are valuable sources of information for MedTech development teams. 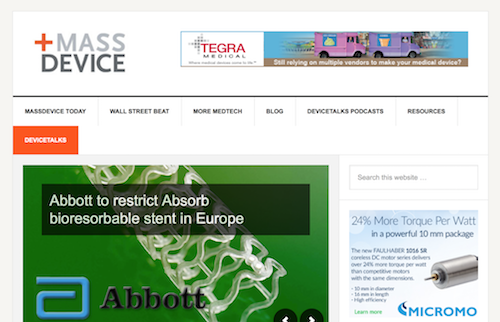 A complete source for medical device news and information, MassDevice offers MedTech and medical device articles, resources, links to DeviceTaks podcasts, and much more to site visitors. 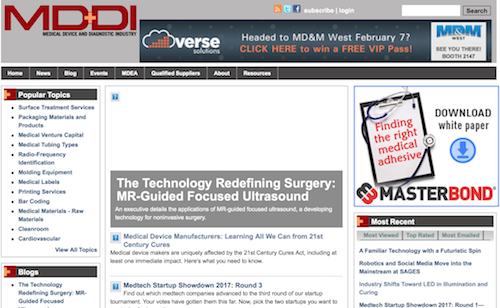 MassDevice is updated frequently so readers easily can find the latest news on MedTech and medical devices with a click or two. greenlight.guru delivers quality management software built exclusively for medical devices to help design and engineering teams get to market faster and reduce risk by simplifying compliance. 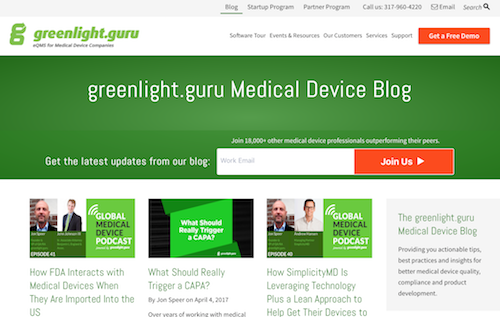 The green light.guru Medical Device Blog includes posts focusing on best practices for medical device product development and offering insights into device quality and compliance. Qmed.com is a news, information, technology, and supplier resource for the medical device industry. 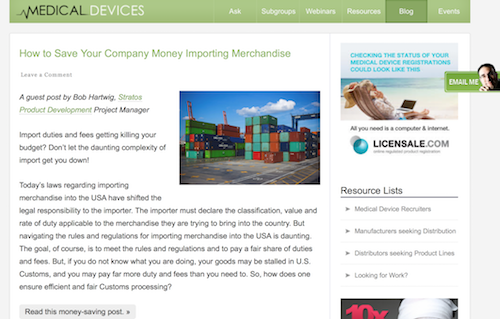 Their Medical Product Manufacturing News is a blog features tips and advice for developing and manufacturing MedTech and medical devices. 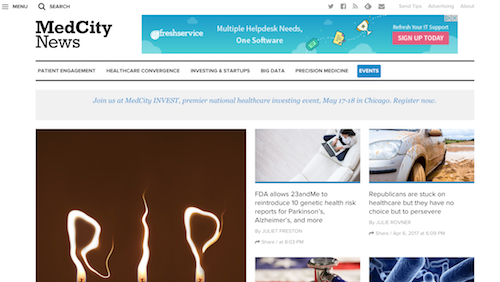 MedCity News tracks the latest in medical innovation from hospitals, payers, MedTech, pharma, digital, and more. MedCity News articles include trends in Health IT, BioTech innovations, and medical devices, to name a few. New Bos Sci Acquisition Raises Question: Will the Lotus (Valve) Ever Blossom? Can a 3D Printing Network for VA Hospitals Realize Ambitions for Customized Prosthetics? MobiHealthNews is a leading source of news in the mobile and digital heath community. 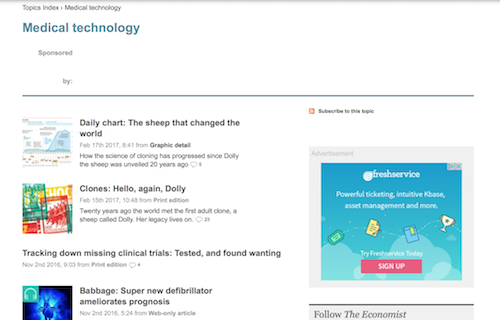 They also share the latest news in MedTech and medical devices and feature educational resources in addition to editor’s picks so readers can find the latest and most relevant information in the field. Consultants for medical device regulatory compliance with a global presence, Emergo shares news and commentary on regulatory changes on the Worldwide Medical Device QA/RA Blog. 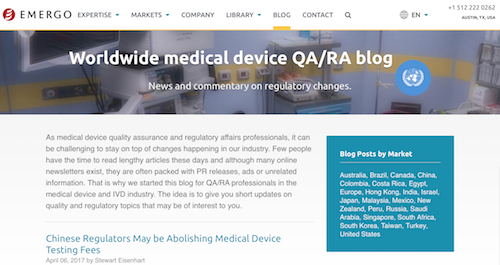 The blog is designed especially for QA and RA professionals in the medical device and IVD industry and shares updates on quality and regulatory topics. 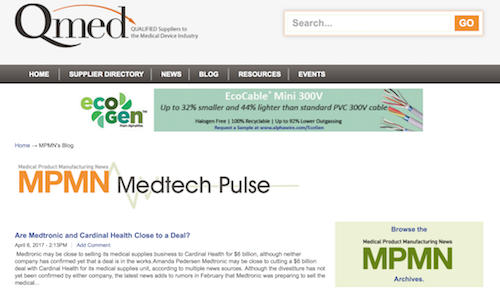 Medical Device Daily (MDD) is one of the most respected MedTech news sources. 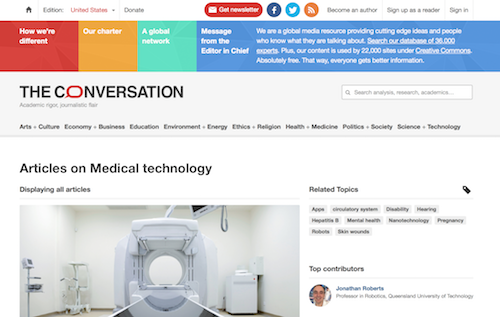 Their blog, Medical Device Daily Perspectives, is a blog featuring critical news, analysis, and commentary relating to the medical technology field. Scott Nelson is a sales and marketing consultant with an enthusiasm for MedTech. He started Medsider to help MedTech designers learn from experienced thought leaders in the field, and that’s why he shares blog posts and podcasts featuring MedTech stakeholders and tips for marketing medical devices, obtaining funding, enhancing regulatory approval procedures, and more. Intertek provides quality and safety solutions to a range of industries through its network of more than 42,000 employees and 1,000 labs and offices around the world. 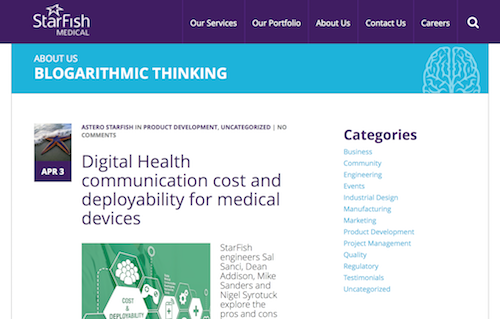 Their blog offers insights into designing and marketing medical devices and making the product development process go more smoothly. Bringing Medical Devices to Market in the U.S.
Questex shares the latest news in the pharma, BioTech, and healthcare industries. 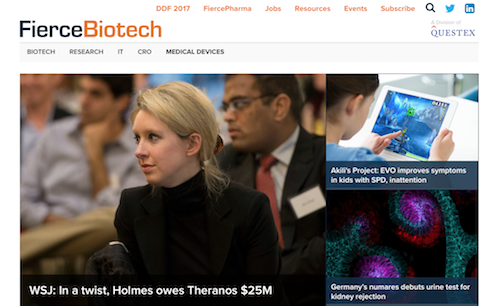 One of their blogs, FierceBiotech, covers biopharma and BioTech news and deals, clinical trials, FDA decisions, and more. Medical Device Academy is an organization that helps medical device designers and engineers with medical device regulatory submissions, continuing education training, and quality system auditing/compliance. Clients frequently seek the help of Medical Device Academy when they have urgent time-to-market needs. Their blog offers advice and tips from experts on everything from ISO auditing and certification to process validation and design control. Color Change Is Only Device Modification. Is a New 501K Required? 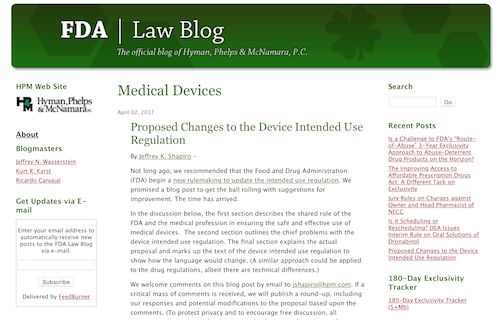 The largest dedicated food and drug law firm in the country, Hyman, Phelps & McNamara, P. C. shares their knowledge of the laws and regulations pertaining to medical devices in their FDA Law Blog. Specifically, the blog covers FDA news, in vitro diagnostic devices, medical devices, and many other categories relating to FDA laws and compliance. Known for being problem solvers, Forma Medical Design specializes in the design, industrial design, and development of medical devices and medical products. 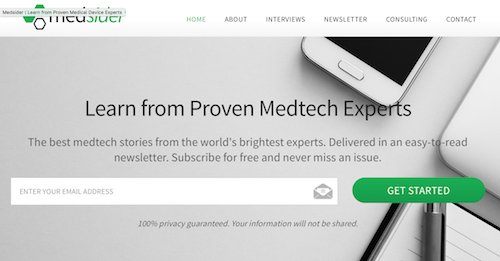 Their blog covers trends and advancements in MedTech and tips for designers and developers. StarFish Medical provides medical device development, design, and manufacturing services to entrepreneurial companies. Their medical blog shares the latest medical device innovation news and covers categories such as engineering, industrial design, manufacturing, product development, and project management. 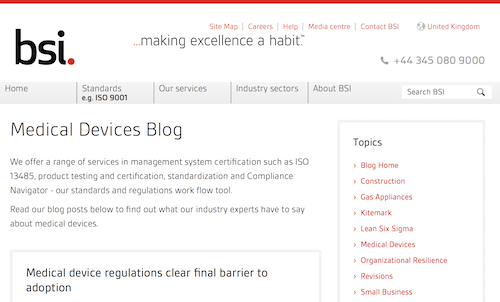 BSI is the UK’s national standards body and the business standards company providing services in knowledge, assurance, and compliance. 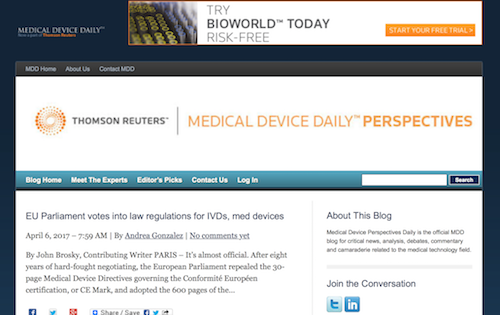 Their medical devices blog offers knowledge and insights from industry experts and includes posts on clinical evidence, ISO regulations, risk management, and many other relevant topics. When Will the Starting Gun Go Off for the Medical Device and IVD Regulations? The Association of Medical Device Reprocessors promotes the legal, regulatory, and related interests of the global third-party medical device reprocessing industry. Their blog shares news, reports, and insights from experts around the globe and has archives dating back to February 2010. 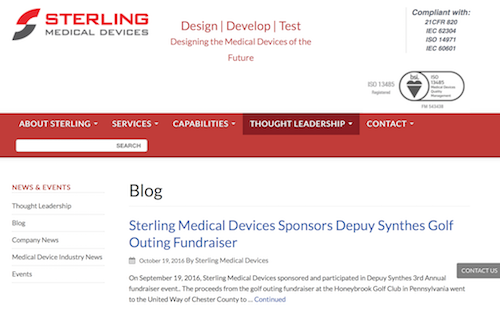 Sterling Medical Devices designs, develops, and tests medical devices and strives to do everything right the first time for successful FDA and CE approval. 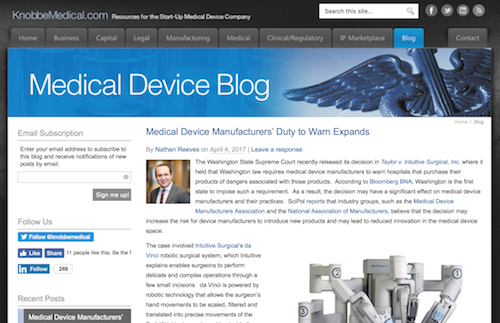 Their blog considers medical device trends and potential issues and offers expert insight into the development process. From Covington & Burling, LLP, provides regulatory counsel regarding medical devices, implants, surgical instruments, diagnostic and therapeutic equipment, in vitro diagnostic products, combination drug/device products, and computerized health information systems to startups and large corporations. 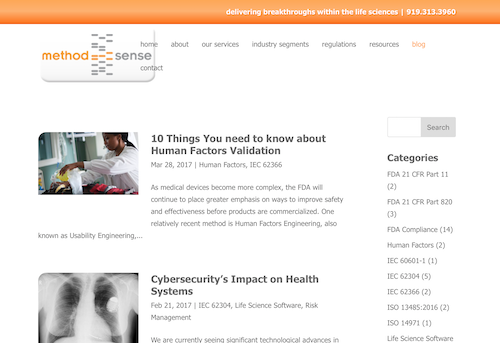 They share their insight and updates on medical devices on their blog, Inside Medical Devices. Medical Device and Diagnostic Industry (MD+DI) covers the medical device and diagnostic industry. A comprehensive news source, MD+DI shares breaking news covering topics such as valves, disposables, pumps, medical device components, and more. 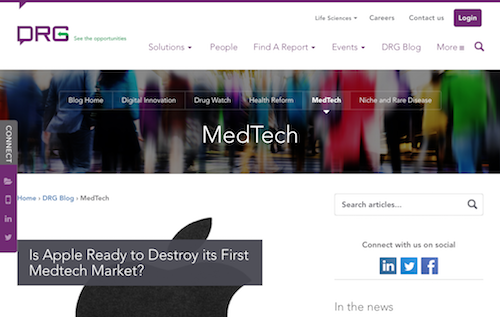 Their blogs also share MedTech news and insights. 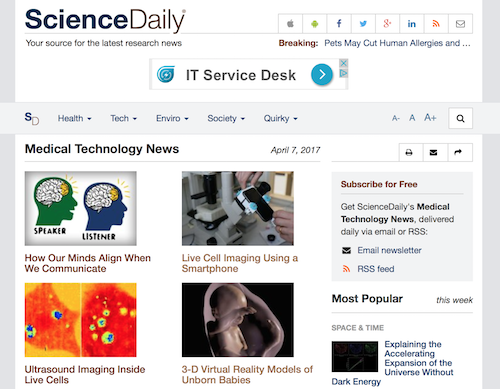 ScienceDaily shares breaking news about the latest discoveries in science, health, the environment, and technology. Their medical technology news is a robust source for the latest news, studies, and advancements in MedTech and medical devices. WIRED Magazine provides in-depth coverage of technology trends and explores how they shape business, entertainment, science, communications, and nearly every other aspect of life. 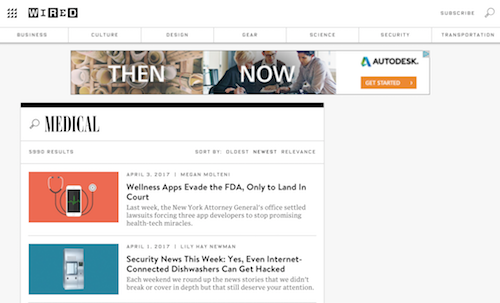 Their online magazine is a robust source of medical news, covering everything from MedTech to wellness apps. 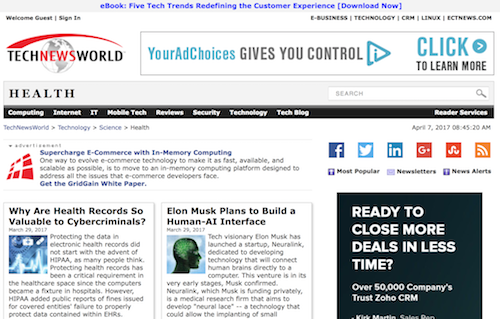 TechNewsWorld shares the latest technology news and information including that relating to MedTech. Their health news covers a wide range of healthcare technology including digital health records, medical devices, and wearables. 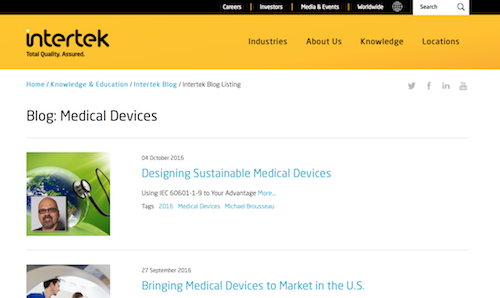 KnobbeMedical Medical Device Blog is a free resource by Knobbe Martens for people exploring a startup, joint venture, or spin-off in the medical device industry. Posts cover breaking news in the industry in addition to recent studies and regulations news. 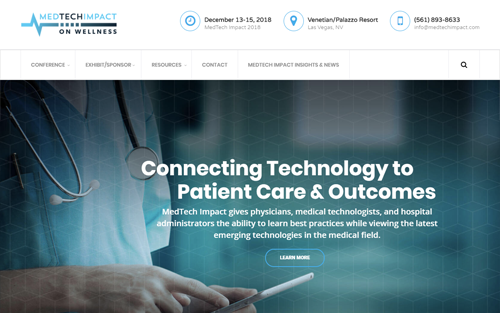 MedTech Impact centers on knowledge for healthcare professionals and suppliers who hope to better serve patients through technology and using devices and products to track progress, assist in diagnoses, and support injury and disease prevention. 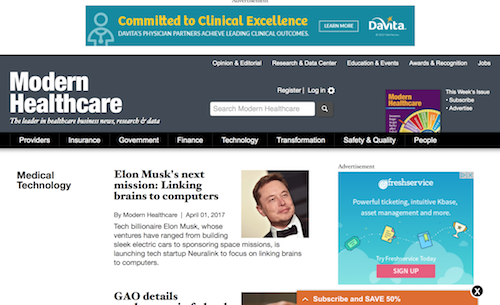 Their Medical Technology News site is a complete source of information for the latest in MedTech news and advancements. Decision Resources Group (DRG) is a global information and technology services company providing the healthcare industry with proprietary data and solutions. Their blog offers MedTech information and insights for readers who want to keep up with the latest trends and developments in the industry. MedTech Europe represents MedTech industries including diagnostics and medical devices. 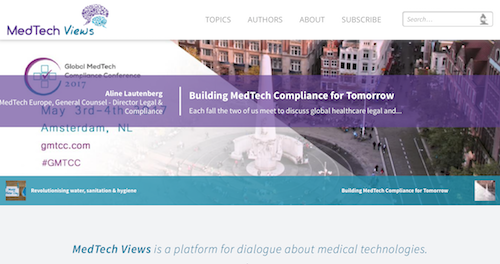 They offer MedTech Views, a blog that provides a platform for discussion of medical technologies and covers topics such as compliance, productivity, testing, and many others. 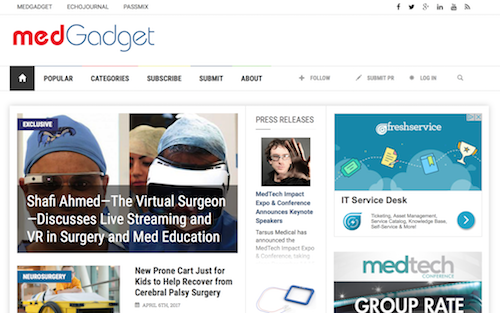 Medgadget shares medical technology news including press releases, interviews with healthcare providers and MedTech experts, medical device reviews, and much more. Recent articles cover topics including virtual surgeons, breakthrough medical devices, and advancements in portable devices. 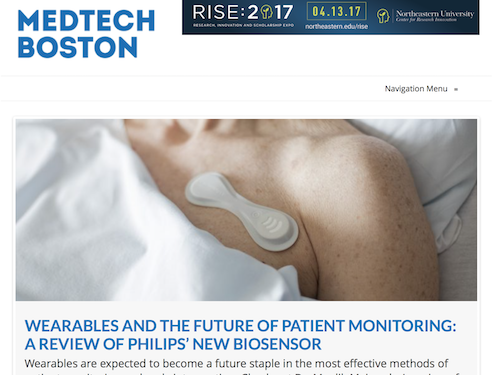 MedTech Boston covers medial innovation and technology in Boston. 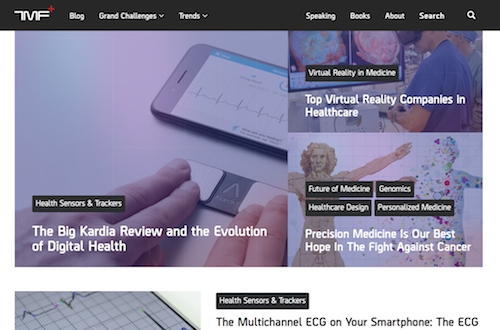 The MedTech site includes articles, events, and opinions on the latest wearables, monitors, healthcare robotics, and more. 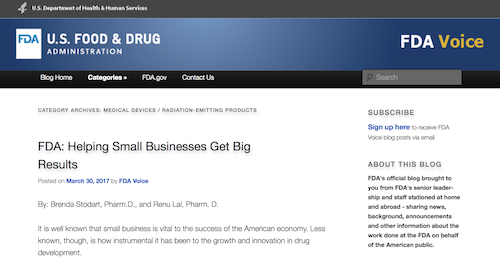 The United States Food and Drug Administration’s FDA Voice is a blog covering children’s health, medical devices, radiation-emoting products, innovations in MedTech, and other categories. 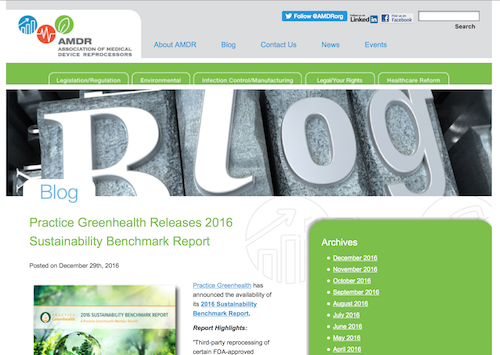 The blog presents news and information from FDA senior leadership and staff. Berci Mesko is a “science fiction fanatic and avid health tracker with a mission to bring future technologies to medicine and healthcare.” As the Medial Futurist, Mesko writes blog posts on healthcare advancements and trends in MedTech and pens reviews various medical devices. U.S. News & World Report is renowned for their opinion and rankings of products, institutions, and more. They also cover education, health, cars, money, travel, law firms, and news from around the world, and their MedTech articles share insights and news on the latest advancements and trends in the field. 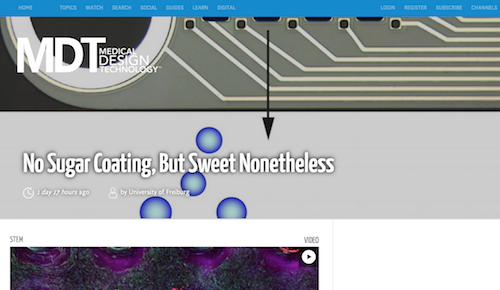 Medical Design Technology is an online magazine covering the new products, services, and technologies available to designers, engineers, and manufacturers of medical devices. 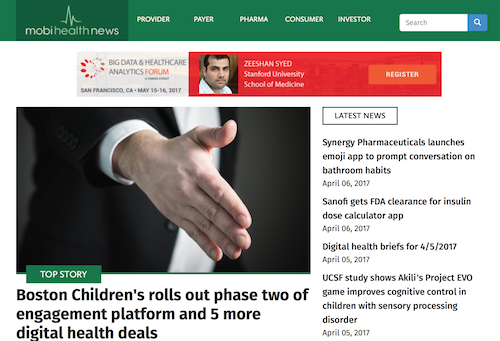 Article topics on this MedTech news site include implantable, prosthetics, wearables, and orthopedics, among others. Delivering news and analysis with a global perspective, The Economist covers world news, politics, economics, business, finance, culture, and science and technology. Their MedTech articles include information about everything from prosthetics to clinical trials. Robotic Surgery: Who Wields the Knife? Modern Healthcare features award-winning healthcare business news, research, and opinion. 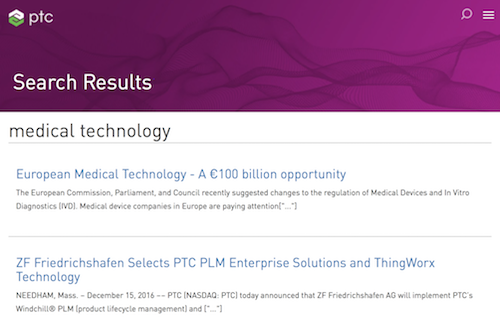 Their MedTech posts cover MedTech companies, devices, and advancements. Hospitals & Health Networks is the flagship publication of the American Hospital Association (AHA). 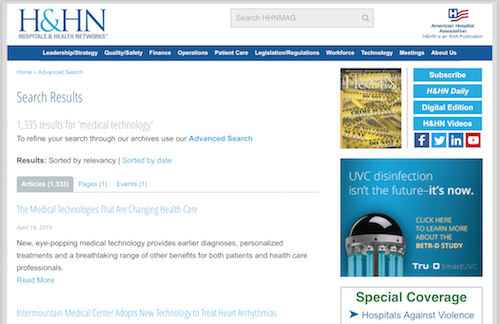 As the leading publication for hospital executives, H&HN shares news and advancements in MedTech and the ways in which it benefits providers and patients. The Conversation is an independent news and commentary site featuring expertise from academics that is edited by journalists. Their MedTech articles are written by professors of medicine, robotics, biomedical science, and orthopedics, to name a few. The Medical Devices Group is a complement to the Medical Devices Group on LinkedIn, the largest medical device community in the world. 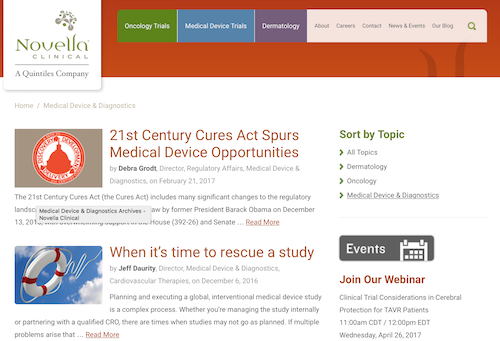 The site offers webinars, resources, events, and a blog with posts written by medical device thought leaders. Please note, to access all of the blog’s content, you will need to become a member of the Medical Devices Group on LinkedIn. 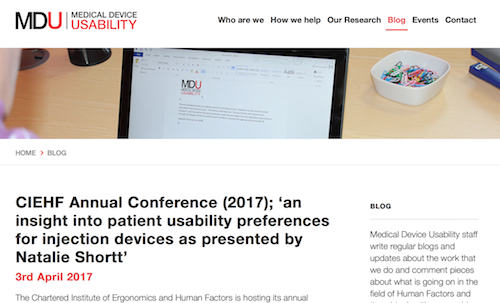 Medical Device Usability is a MedTech blog with updates about devices and the work their staff does in the field. Posts cover usability and market research, regulations and international standards, combination products, and more. 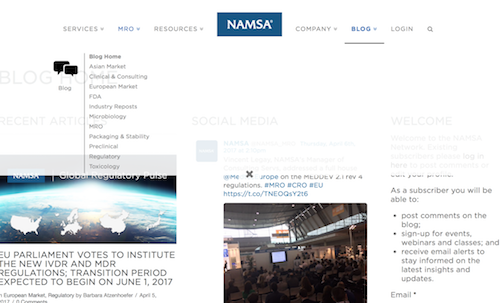 The North American Science Associates, Inc. (NAMSA) is a medical research organization providing expert regulatory, laboratory, clinical, and compliance services to medical device and healthcare product manufacturers. Specifically, NAMSA speeds product development for medical devices, IVDs, regenerative medicine, and combination products. 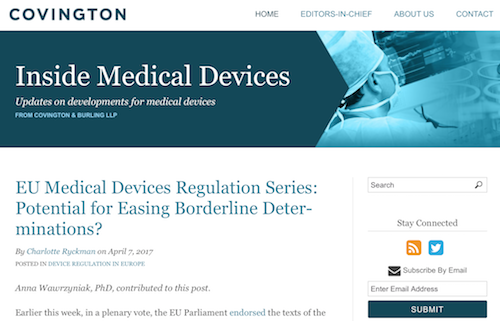 Their blog covers the latest medical device regulations, registration requirements, and medical device development, among other MedTech topics. IMARC Research assists the clinical research community in pursuing approvals from the FDA and other agencies around the world. 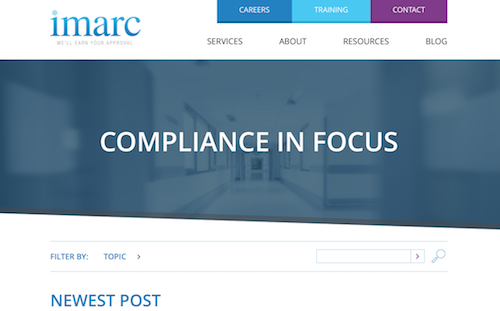 Their Medical Device Clinical Research Organization (CRO) Blog shares tips for meeting regulations, passing FDA inspections, and making it through audits, among other topics. Medical Device Courses is a site providing the basis for individuals looking to understand more complex concepts in medical device development. 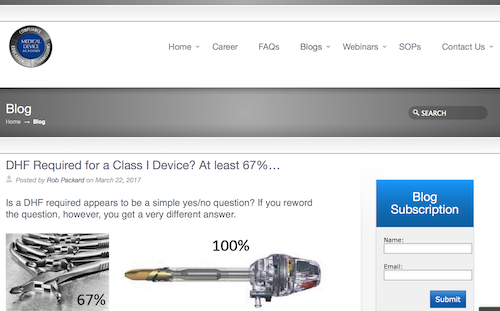 Their recorded webinars give students the opportunity to learn the medical device development process from all angles. 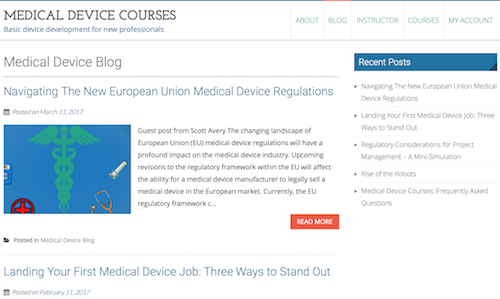 Run by medical device development and training professional Josh Simon, Medical Device Courses also offers a blog with posts sharing advice for meeting regulations, advancing in a career designing and engineering medical devices, and successfully competing the development process. 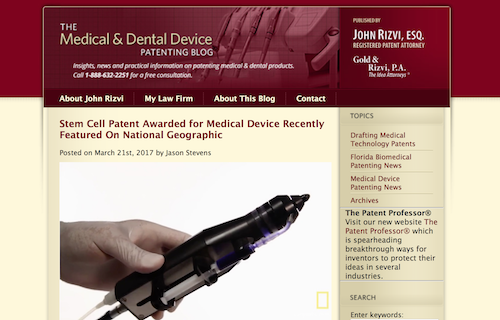 John Rizvi, board-certified patent attorney and the Patent Professor, shares his experience helping inventors protect and profit from their ideas in his posts on The Medical & Dental Device Patenting Blog. Post topics cover MedTech patents, medical device patenting news, and much more. MethodSense is a life science consulting firm located in the U.S. and Europe that guides medical device, biotech, and pharmaceutical companies through quality management, regulatory affairs, and technology solutions. Their Medical Device Consulting Blog posts include information about medical device software, human factors engineering, international standards, and more. The Regulatory & Clinical Research Institute, Inc. (RCRI) is a premier contract research organization for medical devices, IVDs, and biologics worldwide. 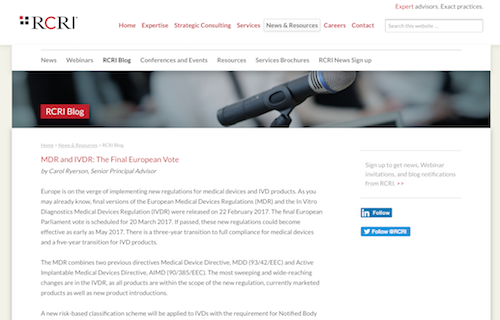 The RCRI Medical Device Blog includes posts written by industry experts and covers topics such as new regulations, clearances and approval, and clinical trials. Medical Connectivity Consulting guides clients through strategy to turnkey solutions for connectivity, interoperability, and workflow automation in healthcare to ensure seamless integration of medical devices into information systems. Their blog features interviews with leaders in the industry in addition to posts covering clinical alarms, wireless devices, data security, going to market, and standards and regulations. 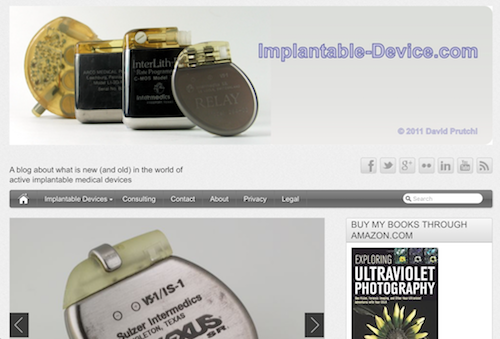 An implantable designer, David Prutchi also is the man behind Implantable-Device.com. The World of Implantable Devices is Prutchi’s blog for sharing what is new and not-so-new in the world of active implantable medical devices. 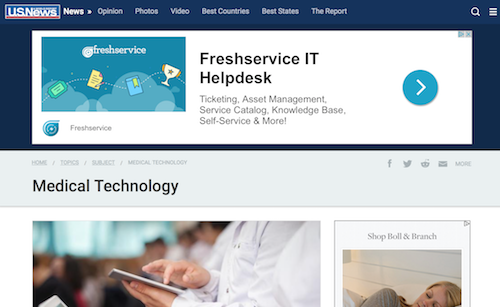 PTC is delivering technology solutions and leadership to the Internet of Things. 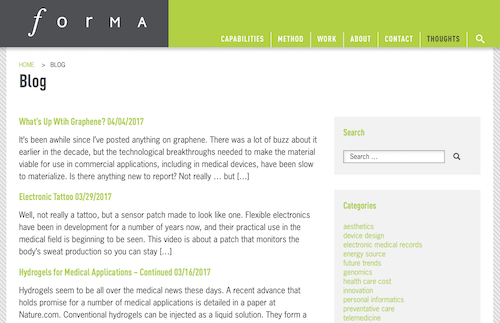 Their blog features a wealth of MedTech news, industry business news, and solutions and advice for medical device designers and engineers. A Quintiles company, Novella Clinical is a full-service CRO serving the oncology, dermatology, and medical device industries. 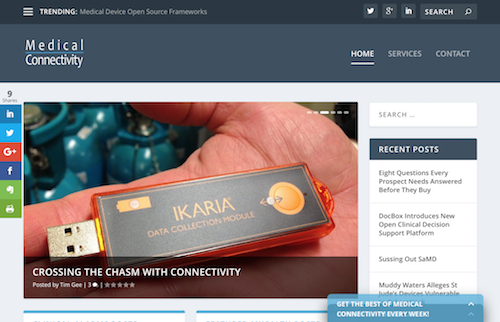 Their medical device and diagnostics blog focuses on the development process and offers insights into best practices for studies, approval, evaluation, and much more. 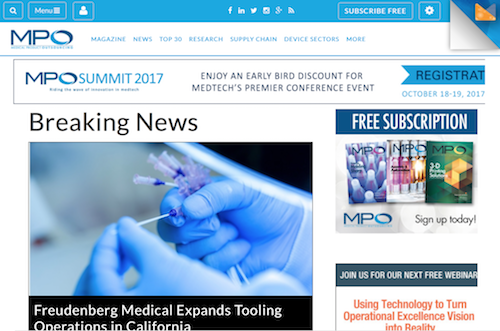 Featuring in-depth coverage of MedTEch industry news, trends, and developments regarding the contract manufacturer-OEM relationship, Medical Product Outsourcing (MPO) is a leading online source for medical device product information. Their breaking news section is an ideal resource for medical device designers and engineers who want to keep up with the latest device and technology advancements, product releases, and insights in the industry. Jama Software is revolutionizing product delivery by changing how products are conceived, built, and launched. The Jama platform enables teams to collaborate and get to market much more quickly. 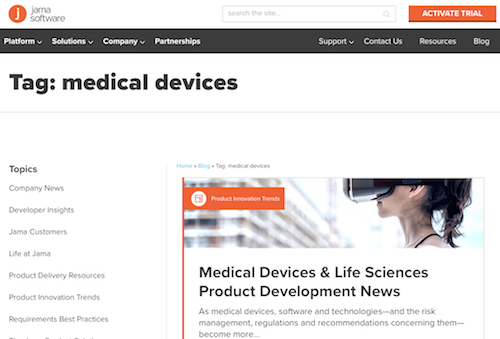 Their blog covers product delivery resources, product innovation trends, and developer insights, and their medical devices posts cover product development news, innovation, collaboration, the changing market, and more.